In 2001, Washington State natives Deborah and David Hansen founded COUGAR CREST at the Walla Walla airport. After graduating from Washington State University in the 1970’s, (Deborah in Pharmacy and David in Veterinary Medicine), their careers led them to the San Francisco area for 18 years. While there, their appreciation for wine and winemaking grew. 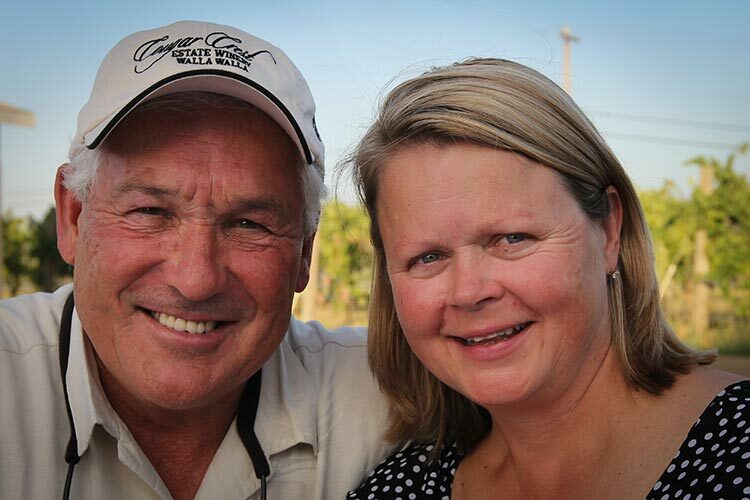 While pursuing their careers and being wine tourists in California, the Hansens purchased land and developed 125 acres of apple orchards in the Walla Walla Valley. In 1995 the farms became self-sufficient and they moved their family back to Washington in 1996. The return to the Northwest was a pleasant surprise. There were seven wineries making amazingly good wine in Walla Walla. After visiting the Walla Walla vineyards, they decided to replace some aging apple orchards with wine grapes. Fortunately self rooted vines are the norm in Washington State so Dave was able to plant all his Cabernet Sauvignon vines from cuttings off the original Seven Hills Vineyard, and Syrah vines from cuttings off Cailloux Vineyard. The first vines were planted in 1997. The vines flourished and more were propagated and planted the following years. Today the vineyard acreage totals 110 acres, all in the Walla Walla AVA. Dabbling in winemaking at home led to bigger things. Starting in 1999, David and Deborah regularly traveled back to UC Davis to take classes on winemaking and grape growing. In 2001 their winery permit arrived. Cougar Crest operated out of a small building at the Walla Walla airport seven years. In 2008, Cougar Crest moved to a new facility on Frenchtown Road. Cougar Crest owns three vineyards in the Walla Walla Valley. Cougar Hills is located a stone’s throw from the site of the original Seven Hills Vineyard planted in the 1970’s that began the Walla Walla legacy of quality vineyards. It sub-divides into hill side and flats. Noble Rock is located in The Rocks of Milton-Freewater AVA. This new sub-appellation of the Walla Walla Valley is unique because of the ubiquitous river rock that saturates the soil profile from the surface to way below the roots of the plants. Rock Bottom is located in the western part of the Walla Walla Valley AVA, Rock Bottom is on relatively flat ground a quarter mile north of Cougar Hills Vineyard. The soil is sandy loam with a gravelly, rocky base that shows on the surface in a few places. The soil is faster draining and dries out more quickly than at Cougar Hills, requiring more diligence for monitoring irrigation, but yielding highly concentrated fruit. This part of the Walla Walla Valley only gets 8 – 10 inches of rainfall per year, the perfect location for controlling the amount of water available to the vinesPlanted to several different varieties this vineyard produces grapes used in all of the core wines. 100% Estate Grown Viognier from 3 vineyard locations and soil types (25% Rocks District of Milton-Freewater, 25% Cougar Hills Vineyard on the hill, and and 50% Cougar Hills Vineyard on the flatland (silt loam)). Cool five week fermentation in stainless steel tanks followed by lees stirring in tank. No oak and no malolactic. Straw color with well formed legs; dry, medium-bodied with freshly balanced acidity and very light but present phenolics. Supple focused fresher Viognier with lots of floral and some tropical to go with citrus and some mineral. BearScore: 91. A blend of 55% Syrah, with 20% Cabernet Franc, 17% Merlot, and 8% Petit Verdot. All Estate Grown fruit. Aged 21 months in oak barrels (15% new). Red color with well-formed legs; dry, medium-bodied with freshly acidity and medium phenolics. Supple, fresh, juicy, and ripe. Lots of juicy red fruit (raspberry and other red fruit). Some spice with black and white pepper. The Syrah is dominant but not overwhelming. BearScore: 91. A classic northern Rhone-ish, co-fermented blend of 97% Syrah and 3% Viognier from the estate’s Block 11 in the Cougar Hills Vineyard. Fermented in temperature controlled stainless steel tanks and pressed after 12 days of pump-overs. Aged 23 months in oak barrels (20% new oak – Hungarian oak and 3 year air dried staves American oak. Red-magenta iwith well formed legs; dry, light-bodied with freshly balanced acidity and medium-chewy phenolics. Deep, delicious, ripe supple. Darker red and some black fruit with spice and a bit of coffee. Lovely texture and feel with dimensionality. BearScore: 94. A blend of 91% Merlot and 9% Cabernet Sauvignon from the estate’s Rock Bottom Vineyard (55%) and Cougar Hills Vineyard (45%). Fermented in temperature controlled stainless steel tanks with three and then two pump-overs a day and aged 22 months in oak barrels (32% new oak of which 75% was three year air-dried American oak and 25% was French oak). Red with well formed legs; dry, medium full-bodied with freshly balanced acidity and medium phenolics. Juicy ripe but still fresh and focused with darker red and some black fruit along with some earth and black pepper spice. BearScore: 92. 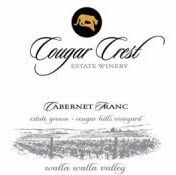 A blend of 91% Cabernet Franc, 5% Merlot, and 4% Cabernet Sauvignon all Estate Grown in the Rock Bottom Vineyard (40%) and Cougar Hills Vineyard flatland (60%). Fermented in temperature controlled stainless steel tanks with three and then two pump-overs a day and aged 22 months in oak barrels (40% new oak consisting of 29% French, 12% Hungarian, and 59% 3 year air-dried-stave American oak. Red-purple in color with well formed legs; dry, medium-bodied with freshly balanced acidity and medium chewy phenolics. Red cherry and berry fruit with spice and elegance. Hints at tobacco and tea leaves. Long and still fresh. BearScore: 93. A blend of 40% Cabernet Sauvignon, 35% Merlot, 14% Malbec, 7% Petit Verdot, 4% Cabernet Franc. Aged 22 months in oak barrels (37% new – 31% French and 69% three year air dried stave American). Red-purple in color with well formed legs; dry, medium-bodied with freshly balanced acidity and medium phenolics. Supple ripe juicy fresh balanced complete. Fresh red and black fruit but well integrated with oak and spice. Long and perfumed. All fits together. BearScore: 93. 84% Cabernet Sauvignon with 12% Petit Verdot and 4% Malbec. All Estate Grown fruit from Rock Bottom Vineyard (48%) and Cougar Hills Vineyard (52%). Grapes are destemmed and crushed before fermentation in stainless steel tanks with pumpovers three times per day, reduced to twice per day once fermentation rate slows down. Pressed after 13 days on the skins, put to barrel in 46% new oak for 22 months. The new oak was half 3yr air dried stave American, and half French. Red-blue color with well-formed legs; dry, medium full-bodied with freshly balanced acidity and medium phenolics. Supple ripe juicy darker red fruit and some black fruit Cabernet offering cedar, tobacco and a bit of stony earth. Elegant balanced style of Cabernet Sauvignon. Integrated and delicious. BearScore: 93+.